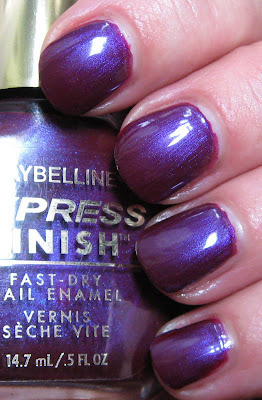 This post concludes Old School Week, so I hope you've enjoyed seeing some of the older polishes! 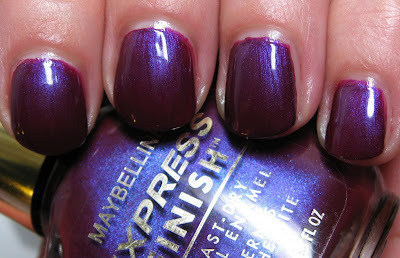 I should do a Maybelline Week, because I have at least 30 more of the older Express Finish colors, but we'll save those for another time. Above & Below: Wild Violet is a fuchsia based violet shimmer that flashes a blue-toned iridescent violet. I wouldn't call it a duo chrome, but it does have a little bit of color-shifting action going on. Below: Tassled Taupe is one of my favorite shades and it was probably ahead of it's time trend-wise when it first came out. This darker taupe creme shade is shown indoors and outdoors, and the delicate gold shimmer is visible in any lighting. Below: Planet Pluto is a shade I prefer over a darker color, and is shown here over Wild Violet using 2 coats. 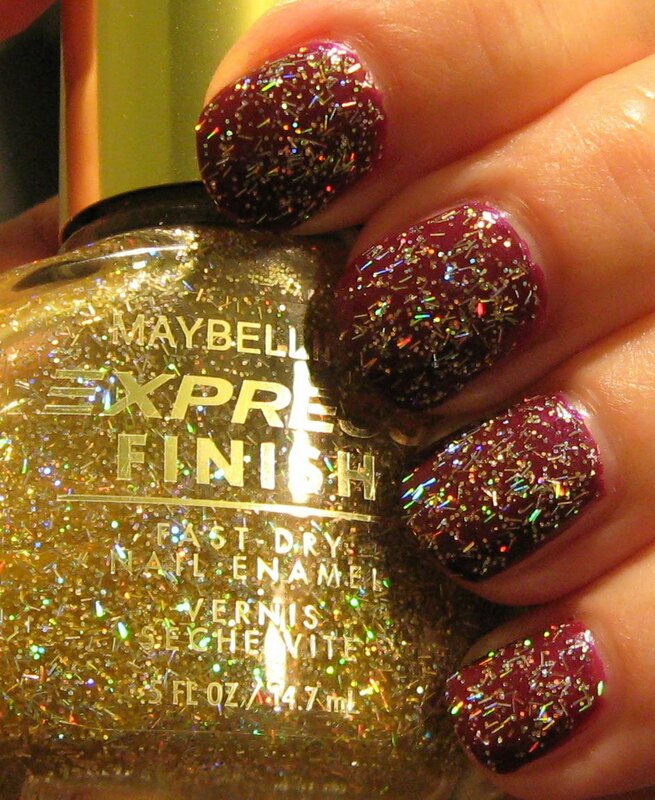 This multi-colored multi-shaped glitter shade appears to be mostly gold in the bottle, but the glitter is holographic and changes color with any movement of your hand. 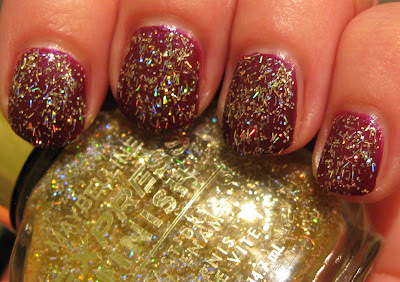 The bar glitter in this is very fine, so it's easy to get an even coating of glitter. Below: Matte Blue is a bit frosty or pearly, and it's an icy blue with a slight hint of grey. I prefer this with a clear top coat, as shown in the last photo. I sometimes tire of all of the new polishes, so it was fun for me to recall some of these older ones. Naturally though, I'm never satisfied because I'm anxious to get back to some of the newer ones tomorrow! 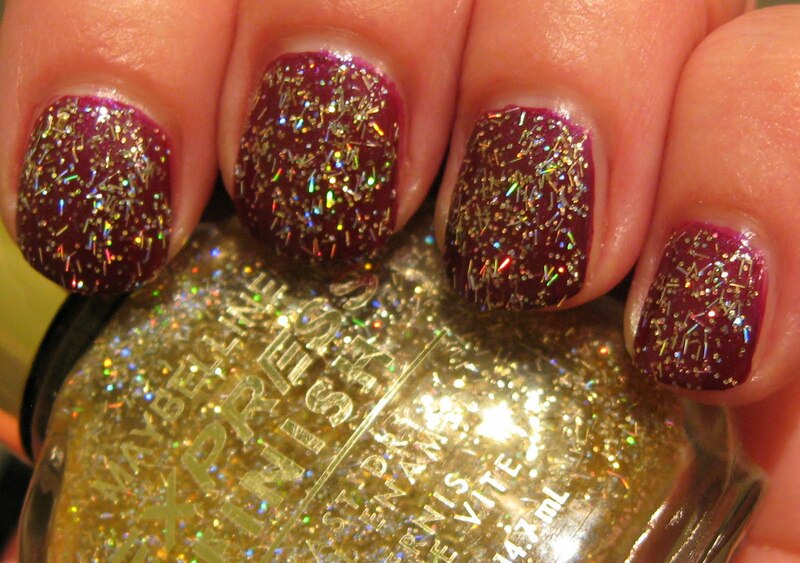 The first two lacquers are stunning! I've really enjoyed your old school series this week. Maybe you could continue by having an old school day once a week or a couple of times a month? i also love tassled taupe! This was fun seeing all of these old polishes. I'd love it if you did this even one day a month. I too get tired of the same new polishes on every blog. I do love seeing new things so I know what to buy. Once in awhile I don't mind at all seeing older stuff.